Been meaning to post about a clever new idea for aspiring bakers. I baked these cupcakes using the silicone cupcake holders, cake and icing recipe from issue 1 of Baked & Delicious (usually sells at R69.95 per issue. Issue 1 was available at R29.95 special launch price). This British “magazine” concept launched in South Africa in late July 2011 and they sent me issue 1 to try out. Included in every magazine issue is a free silicone bakeware or cake decorating item, to use in one of their featured recipes. If you subscribe to the magazine, a new item arrives with the latest issue by post every two weeks. Issue 1 and 2 - including silicone extras - are also available now in local newsagents and selected supermarkets. The second issue includes a silicone spatula and brush (special price of R49.95). My experience? 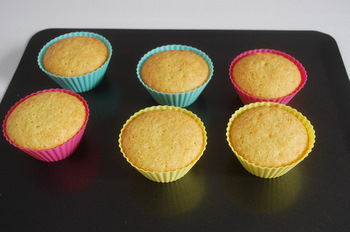 Six colourful cupcake cases were easy to use, and didn’t wobble when placed on a flat baking tray. Thanks to clear recipes with photos for each step, the cake mixture was easy to make and produced golden sponge cake that was light yet very tasty. The icing recipe worked fine too. 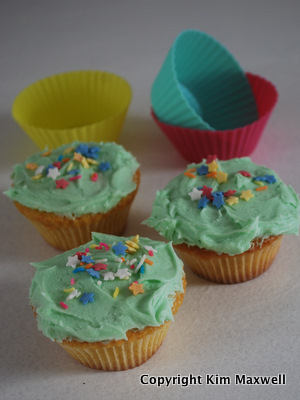 I placed paper cupcake cases inside the silicone holders - iced cupcakes look odd if you don’t - but the advantage of using silicone products is that you can bake without greasing the surface and the mixture won’t stick to the sides. Glad to write to you! We are a silicone product manufacturer, I am David Lee. Can we become the strategic partner on the market? Can we realize your design for the silicone project? We have design Hub, even your dream or image can be transferred into the solid prototype samples and the ready products, we have very good comprehensive understanding for the silicone material and the manufacturing. Please get our e-catalogue from http://www.longsun-rubber.com. Please don’t hesitate to send your any inquiry(questions for silicone products) to us for a solution. LONGSUN Silicone Rubber Technology Co., LTD.